This framework has been seen well over 1 million times through its publication in newspapers (!) and other media outlets in over 30 countries. It is designed to be provocative, and has certainly generated significant controversy. In general I do not believe in making specific forecasts, as the future is unpredictable. However it can be useful to be very specific, as it can sometimes generate more pointed thinking than generalities. Certainly the news-on-paper industry needs some very focused thinking today. 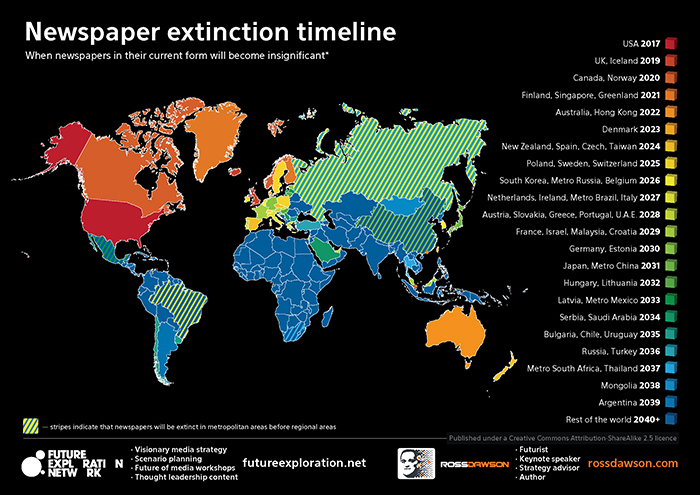 This schedule for newspaper extinction shows best estimates given current trends. The timeline is intended to highlight the diversity of global media markets and stimulate useful strategic conversations. Newspapers in their current form becoming insignificant is not the same as the death of news-on-paper, which will continue in a variety of forms. 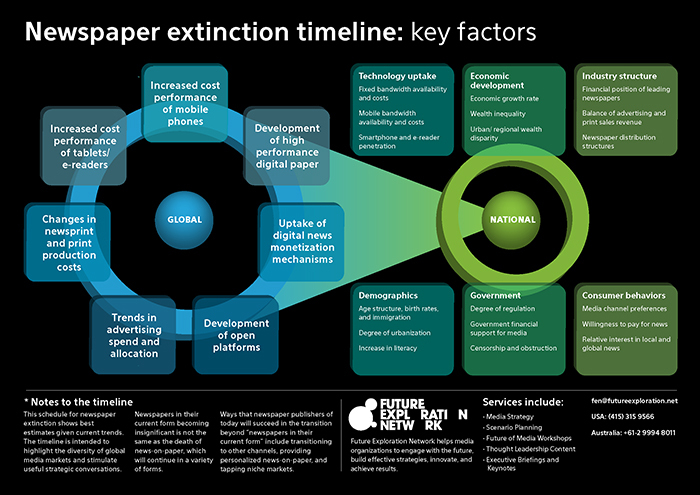 Ways that newspaper publishers of today will succeed in the transition beyond “newspapers in their current form” include transitioning to other channels, providing personalized news-on-paper, and tapping niche markets.